(Tech Xplore)—Memory tech is in the April spotlight in the form of Intel's new Optane solid state drive. Reports are in that Intel's new 3-D XPoint based Optane SSDs are ready for shipping. For techies watching out for memory breakthroughs, this is seen as significant. One would have a difficult time finding any article about something called the Optane SSD DC P4800X, the new storage drive (a 375GB PCIe based SSD) that did not use superlatives. Ali Raza, TechJuice, said Friday that Intel launched the fastest SSD storage. Raza said, "It reads and writes information on the storage faster than the NAND technology employed in current SSDs." Other writers called it insanely fast. TechSpot called the 3-D XPoint SSD the "new king of enterprise SSDs." 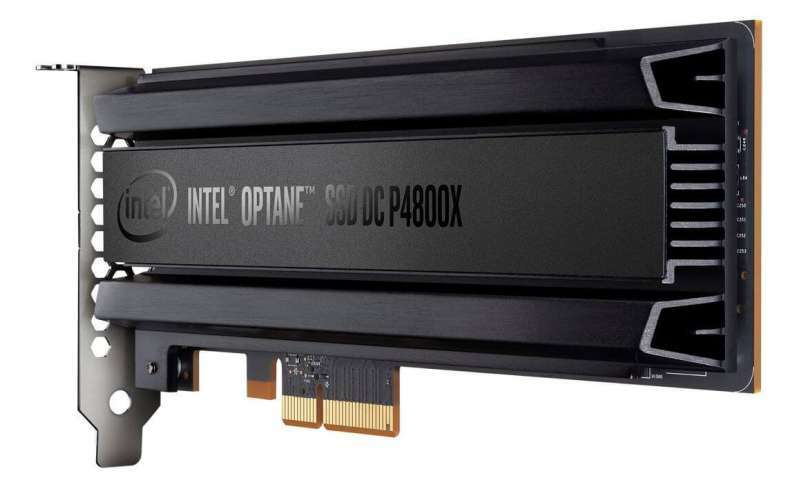 Paul Alcorn, contributing editor, Tom's Hardware: "Optane is Intel's all-encompassing brand name for the collection of technologies, including 3-D XPoint media, memory, storage controller, interconnects, and drivers, that power the DC P4800X." Katherine Bourzac, IEEE Spectrum, said Optane drives "are nonvolatile, like flash memory, which means that they should use relatively little standby power and that they're fast, like DRAM." Intel's Enterprise 3-D XPoint technology plays its part in this news. The 3-D XPoint technology which Intel is using here was developed in partnership with Micron technology, said Digit. Bourzac called 3-D XPoint the "mystery technology inside Optane." 3-D XPoint is designed to bridge the gap between NAND and DRAM, said Tom's Hardware. AnandTech said that "the use of 3-D XPoint memory instead of NAND flash memory allows it to deliver great throughput and much lower access latency than any other NVMe SSD." With 3-D XPoint's persistence and high performance, it can serve in both memory and storage roles, slotting into the new "storage-class memory" category," said Alcorn in Tom's Hardware. "In 3-D XPoint storage, each data cell does not need a transistor so the storage density can be up to 4 times that of standard DRAM. It offers the incredibly fast speeds and access times of DRAM, but has the capacity of traditional flash storage," said William Gayde in TechSpot. Bourzac discussed the XPoint term: "While flash memory elements must be read and written in groups, XPoint elements—situated at the crossing point of interconnects—can be addressed individually." She said that according to James Myers, who works on nonvolatile memory architecture at Intel, this architecture, and something inherent to the storage materials themselves, makes 3-D XPoint faster than flash memory. So who is getting these first shipments? Billy Tallis in AnandTech: "So far, Intel has only started shipping the 375GB Optane SSD DC P4800X to select customers, and they have not released detailed specifications for the larger capacities that will ship later this year." Alcorn, Tom's Hardware, said Intel's Optane SSD DC P4800X was destined for the data center, "where it'll introduce game-changing (I don't use those words lightly) performance." According to IEEE Spectrum, Myers said this first product will enable data centers to do more with a smaller number of servers. The new 3-D XPoint drives " are the best drive available for heavy enterprise level I/O operations," said TechSpot. Wccf remarked that "Intel's 3-D XPoint based DC P4800X SSD blows away the competition with sustained performance under heavy loads." The MSRP for the 375GB P4800X is $1520. Usman Pirzada, senior editor, hardware, Wccf: "While it is bleeding edge tech at the moment, the price will eventually come down to more palatable levels and I have no doubt it will be able to disrupt the NAND industry then." Raza in TechJuice predicted that "this new technology will eventually edge out the conventional flash storage the same way flash storage is edging out traditional hard drives." "The potential significance of 3-D XPoint memory is immense," said Tallis in AnandTech. Tallis said that it is "the first new truly mass market, high-density solid state storage medium to hit the market since NAND flash itself. It comes at a time where the NAND market is booming like never before, but also at a time when we know that there is a definite end of the line for NAND." Tallis explained further. "Once NAND can no longer scale in density and cost-per-bit, it will fall to paradigm changes and next-generation memory technologies (one of which will be 3-D XPoint) to continue to carry the industry forward." Might Intel Optane memory tech come to MacBooks? Why did Phys.org pay Nancy Owano to write an article that consists exclusively of "superlatives" copied from other publications, when she clearly doesn't understand what they actually mean? Reporters are supposed to tell the accurate story of what is happening. If they can't understand what is happening they can't be a reporter. But they can be a marketer. A better article on the technology is at https://en.wikipe...D_XPoint It claims 9 microsecond latency which is substantially faster than typical flash storage (~200 microseconds) but "showing 2.4−3× improvement in benchmarks compared to PCIe NAND flash solid-state drives (SSDs)". So it seems to me the first number isn't accurate or is measured on the chip as opposed to measuring it via some interface like a PCI interface. It's slower than DRAM latency which is around 10 nanoseconds. Still, this is a significant improvement for persistent storage. 375 gigs?? Yawn. Get back to me when it's 10T and cheaper than a hard disk. It's the performance, not the capacity, that makes the Optane the cutting edge of storage tech. Nancy Owano is that you? "It's the performance, not the capacity"
Oh, I get it, very fast. But what use is a quick mouse brain?